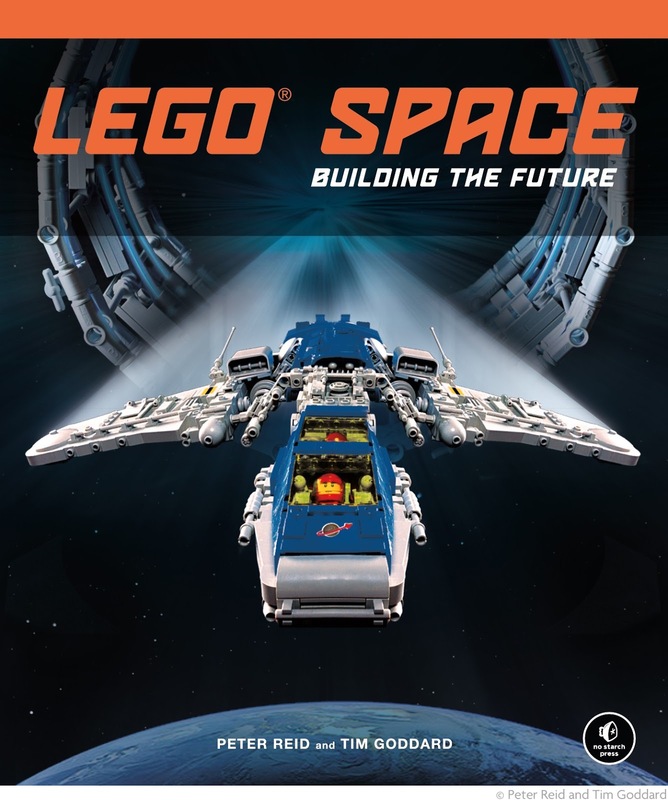 Peter Reid is big news already this week – his Exo Suit model, which appears in this book, has been selected by LEGO to be the next official CUUSOO model. 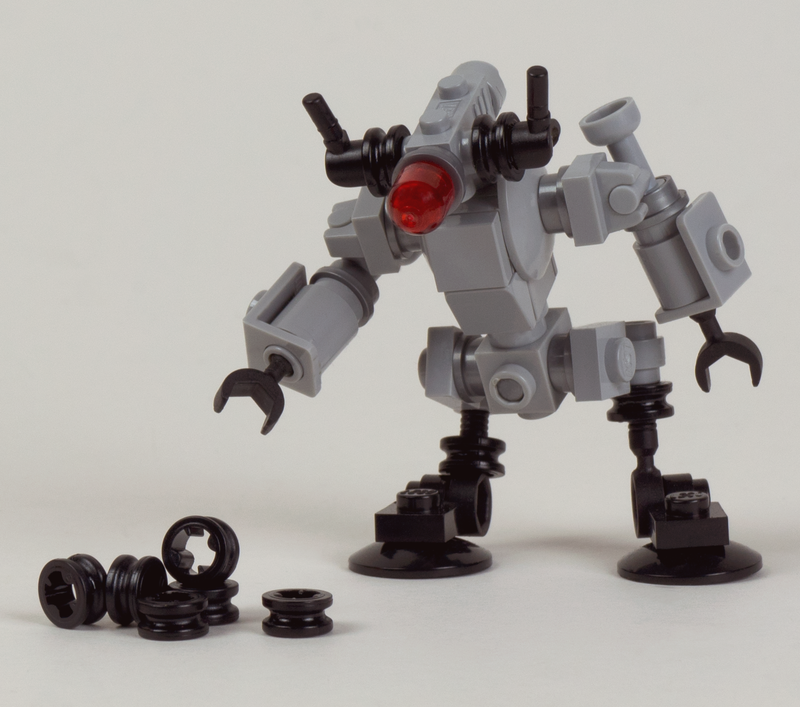 Of course the LEGO version, due to be adapted by Designer and Mecha master Mark Stafford, will be a different beast… for starters, the non-production parts and the illegal building techniques will need to go… but I’m thrilled for Peter and relieved LEGO have selected Mark to do the official take on it. 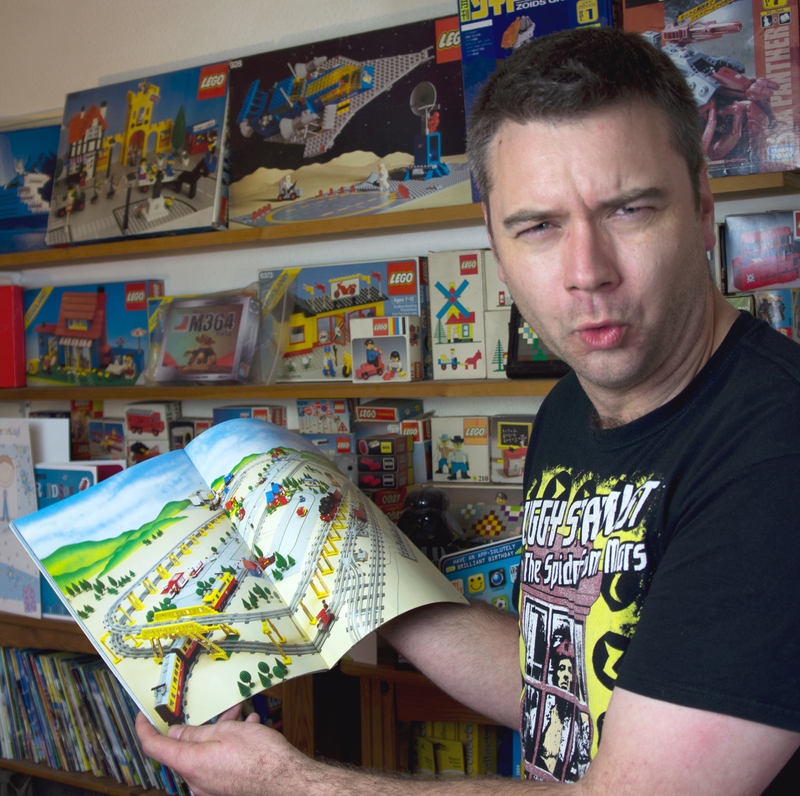 Peter lives in Romford with girlfriend (and awesome AFOL) Yvonne Doyle, so I thought I’d take the opportunity to quiz him in person about what classic LEGO elements we can expect to see used in the Space book, plus some of the exciting rarer stuff. Peter produced several cups of tea and some lovely elements from the array that fills pretty much every room in the house, including the loft. TJ: How did the book come about? PR: It all started when Tim Goddard was contacted by No Starch Press, who had spotted his section in DK Publishing’s LEGO Ideas Book . They wanted to know if he'd be interested in doing a Space book. At that point, Tim and I had been collaborating for some time, and he asked if I'd be interested in helping him develop it. I have never replied to an email so quickly. No Starch Press are an independent publisher not affiliated with The LEGO Group. 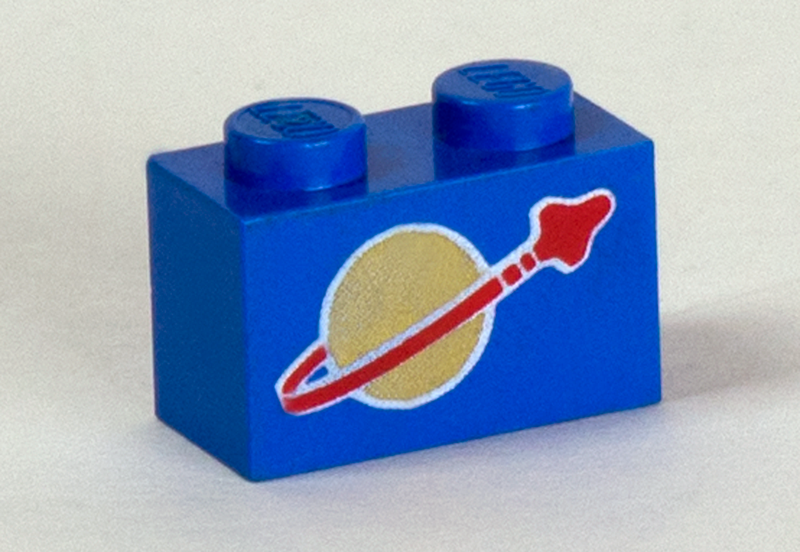 For copyright reasons we weren't allowed to use trademarked names like Blacktron, Ice Planet and Space Police. Apart from that, we were pretty much given full creative freedom; including building techniques. TJ: That sounds quite different to the 'rules' when we worked on The LEGO Play Book for DK. PR: It was very different, yes. For that we had to conform to current LEGO standards, using only recent parts and building in a way kids could deal with. The company's worst nightmare is a complaint letter saying Little Timmy didn't have the parts for the model in the book, and had a bad building experience. With the Space book, we were able to fully utilise our collections, and not worry about using parts that were discontinued or of mysterious origin. TJ: What about Little Timmy? What if he has a bad building experience? PR: Little Timmy is a child. He's not going to be able to cope with next-level building. We made these models to our own standards of excellence. 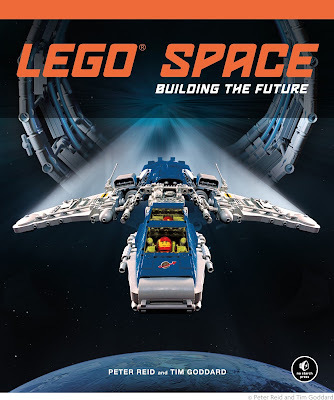 But any kid who likes sci-fi and LEGO will enjoy the Space book. Remember 7777, that gorgeous trains Idea Book from the ‘80s? That had stuff in it that was completely unattainable, yet it just made me love LEGO even more. Gazing at the centrefold of 7777 never did me any harm. Made me into a man. TJ: Well, now Big Timmy is in the mood for elements, and more tea. Let’s go all Old Elementary with some of your favourite parts you used in the book please Pete. Can you start with some of the real classics? Getting hold of pristine condition Classic Space guys is a lifelong quest. I've been lucky enough to pick up some really good quality ones over the years. That torso design has stood the test of time, and fills me with nostalgia and enormous wellbeing. Sometimes I think I should get a massive tattoo of the Classic Space symbol on my chest, but it might upset Yvonne. 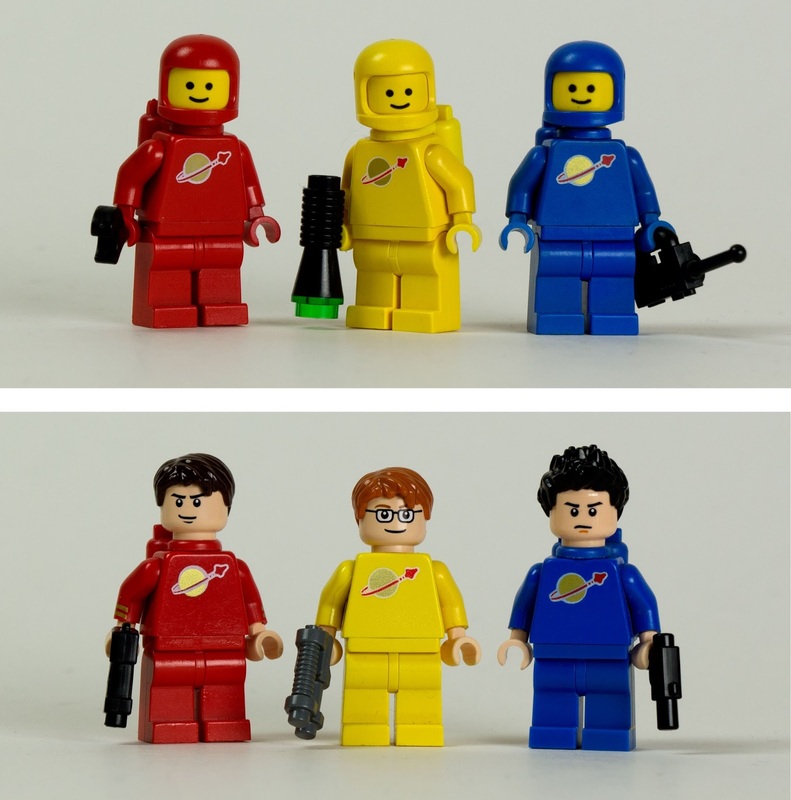 PR: Once they've been updated to the Neo Classic Space standard, they're my favourite little guys: a 'fleshie' coloured head and modern hair brings them nicely up to date. It's the cockpit colour of choice for NCS and Blacktron builders, but does not age well. I have gathered a lot over the years, but use only the very best condition examples on NCS models. There are a few classic Trans-Yellow parts that are basically impossible to get in new condition. The slightest contact with other LEGO pieces makes them scuffed, it seems. The 33⁰ 3X6 windscreen (seen at the front here) featured in the three spaceships from the first wave of Space sets in 1978/9 and the last set they appeared in was in 1986, so buying sealed ones would be very expensive - and no guarantee the contents weren't badly scratched anyway. A good source of cool Trans-Yellow parts is 6987 Blacktron Message Intercept Base, which is the only set with the 3X3X6 convex corner (part 2468, seen on the right of the pic). It's a lovely piece, which I've used a few times. The Trans-Yellow 3X4 panel (part 4215, seen at the rear) is another much-cherished piece also found in Message Intercept Base, as well as others. The 6X4X2 canopy (part 4474, seen at left) is slightly easier to come by, but the chances of finding mint examples diminish as time passes. Another part that's over 30 years old here, with gold printing that fades at the drop of a hat. It seems the slightest contact messes up the printing, so it's tricky getting hold of good ones. All of mine suffer from playwear, but I love them and will continue to search for the finest examples. They're essential for spacing up a ship or futuristic wall, and came in three colours. The old clip with ring, part 4081, offers different geometric possibilities to the current thick-ringed type. 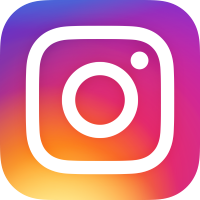 (The above picture alternates between the new thick and old thin versions.) It's a shame they were discontinued, but there are still plenty of cheap ones available. Everyone should have a few of these in their collection. I used two in the LL-290 shuttle (pic at page top), and they are a critical part of the model. The book has instructions to build it. The old grey finger hinges are used extensively in NCS models. There's a lovely family of them out there, and it's a terrible shame they were phased out. I presume Little Timmy complained to LEGO because he broke one. I've used them for years and never broken one. The replacement click hinge family, with its limited degrees of positioning, was a step backwards. I think the LEGOLAND builders were hit hardest by the demise of the finger hinge, as they still use them on Miniland figures. I've been using these domed light bulb covers (part 4773, intended to change the colour of lights in the 9v electric system) as eyes on my robots, like this Blip below, for a very long time. The part survived until 2005 and it’s such a pity it's been replaced with the Barraki eye (part 58176), which looks similar but doesn't do the same job, thanks to the dirty great 3.18 sticking out the bottom. I can't make my Blips with the new ones, not even using Apollo studs, so I'll stick with the vintage ones, thank you very much. Briefly glimpsed in the Space book is a Trans-Clear light bulb cover, which never appeared in sets. Just think about that for a second... it's a light bulb cover, to change the colour of the light, and yet it's Trans-Clear. 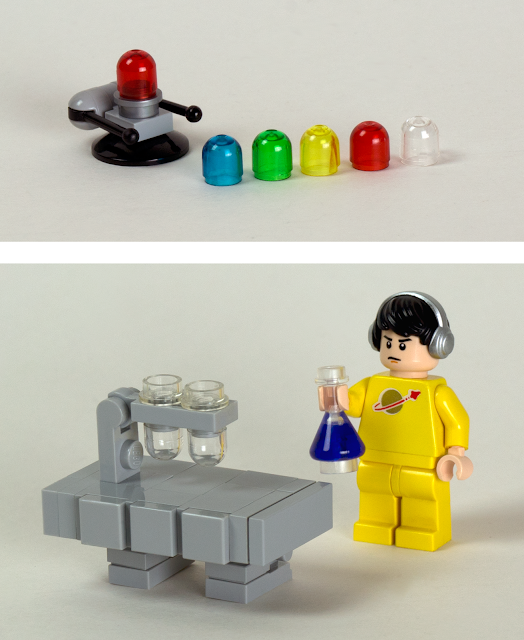 They make excellent test tubes for spacey scientists. There are a few available on Bricklink, and they're not too pricey, considering they don't exist. Two of these were in 7019 Viking Fortress against the Fafnir Dragon, a set from 2005. So although that’s much more recent than other prts I've mentioned, it’s the only time they've ever been available. The Fortress was a big set, over 1000 pieces, but there's only two black bushes plus a spare per set - so it's difficult to get them in the quantity I need. Definitely expensive. This Crusader series mechanoid from the Space book uses four of them. They're such a delicious little detailing piece. This pair of HC series mechanoids are full of pure precious. I can't make any more. The dark bley tool wheel (part 6246) was only in 7251 Darth Vader Transformation and an obscure Education set of minifigs, 9247 Community Workers. These wheels go for silly money now and LEGO will never include them in a set again, as the tool wheel design has been changed this year. These guys also use dark bley taps in their arms, which don't exist at all. If I wanted to use dark bley taps in a new model, I'd have to disassemble these two guys, which is unthinkable. There's something undeniably thrilling about using rare and non-production parts. I'm not talking about just hoarding, say, a big bag of bley Falcon rigging for no reason. I prefer to use the precious things in actual models. They can add a unique touch to a model, and elevate it to the next level of awesomeness. It's not a sustainable way of building, but it's nice once in a while. 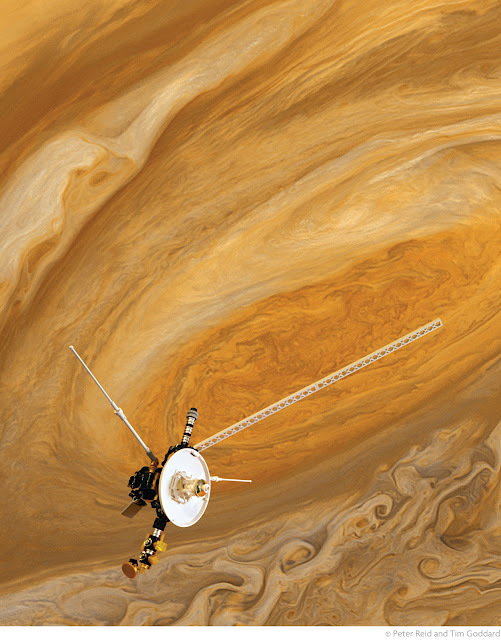 We used four White whip antennae on Sputnik before realising they were a non-production part. I've no idea where they came from. 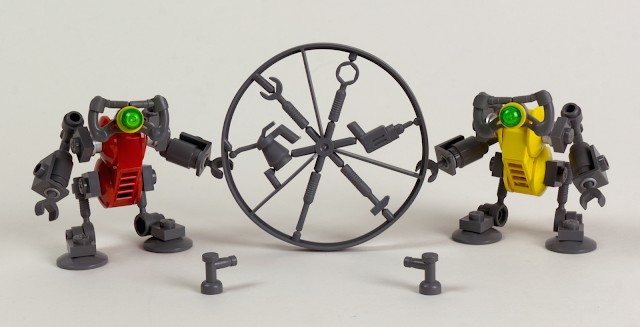 But Sputnik is one of the models that has instructions in the book and it would be bad form to put non-existent parts in those, so we had to change them at the last minute. It's a shame, they look really good. But we used two on this Voyager model. Sadly there are none for sale anywhere, and I can't remember where I picked them up. So as far as I know they are the only six in the universe, and they are definitely not for sale. Thanks for this inspiring glimpse into the back catalogue Pete – and the stuff that fell off the back of a truck! I was going to complain about the shift to fleshie heads, but I suppose after a lifetime in deep space it would be entirely natural for humans to develop a deathly pallor due to having never been exposed to natural sunlight. Oddly enough, NCS is almost the only place I *like* fleshies--I much prefer them there to any of the licensed themes they've occupied. Whereas with most licensed themes, I still find after a decade of them that they detract (to my tastes) from the LEGOfication of the source material, but with NCS I find that it sharpens the "neo" element, a signature style that's distinct from what simple Classic Space MOCs would look like--mind you, I think the real key is that the fleshtones look incredibly sharp against the bright monochromes of the classic uniforms, where the uniforms supply the "LEGOness" otherwise provided by the yellow flesh. Great write-up, and a very interesting take on it, since I love non-production parts. I got my copy of the book last week, and it's gorgeous. Pete and Tim really outdid themselves. I've now read it too, and was blown away. Expected greatness and it was greater. It seems like the Classic Space section of this article, including the part about not being able to get "Getting hold of pristine condition Classic Space guys is a lifelong quest" and the section about transparent yellow pieces, has been answered. I know this is a rather old article, but I was searching about Apollo Studs, as you called them, as I have just received my latest order from lego, which included Cloud Cuckoo Palace from The Lego Movie theme. The Lego Movie theme continues later this year, as I'm sure you're aware with some huge sets, including Super Secret Police Dropship and.... Benny's Spaceship Spaceship SPACESHIP! Benny's set looks amazing, with many pieces reminiscent of the Classic Space theme, blue with the gold-printed Space logos, trans-yellow windscreens and all. In fact I have one of those sets, 6883 Terrestrial Rover, released in 1987, and has a white minifig with the old-style helmet. I'm not sure if the Classic logo rubbing off applies to other pieces besides the 1x2 Blue brick (the set didn't come with any), but 6883 contains two "Blue Tail 4 x 1 x 3 with Classic Space Pattern" (as BL calls them) and the logos seem to have fared pretty well considering I've had the set since 1987/1988 (i still do, albeit with a ton of missing parts, and it's not alone in that regard :/ ). Will there be an article about the new sets coming out later in the year? 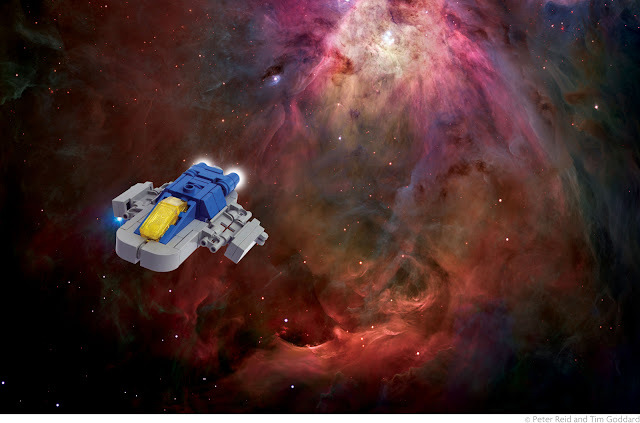 I haven't looked, but an article on the Nuremburg Toy Fair Lego reveals would be nice! I absolutely love the Legends of Chima Maula's Mammoth Stomper set shown there! In my experience, Grant, the print on 1X2 CS bricks generally holds up much better than the CS torsos. I don't know if I will review all the Summer wave Movie sets, but it is almost certain the spaceship will get a special post! I'm a CS nut from back in the day when it was just blue and grey parts with only white or red spacemen, so I'm as excited as Benny. Agreed on the Mammoth! I doubt I'll report on Nuremberg. It's too hard to be certain of the proper colour of parts, for a start. I'd rather wait for proper pics. Neoape and The Brick Fan have been posting a lot about them though if you're desperate for coverage. Indeed, the Mammoth Chima set looks to be of a mammoth size! Those feet are made from trans-light blue windscreens, 6 x 8 x 2! Those windscreens are already a big piece, so this mammoth looks to be about a foot and a half tall. 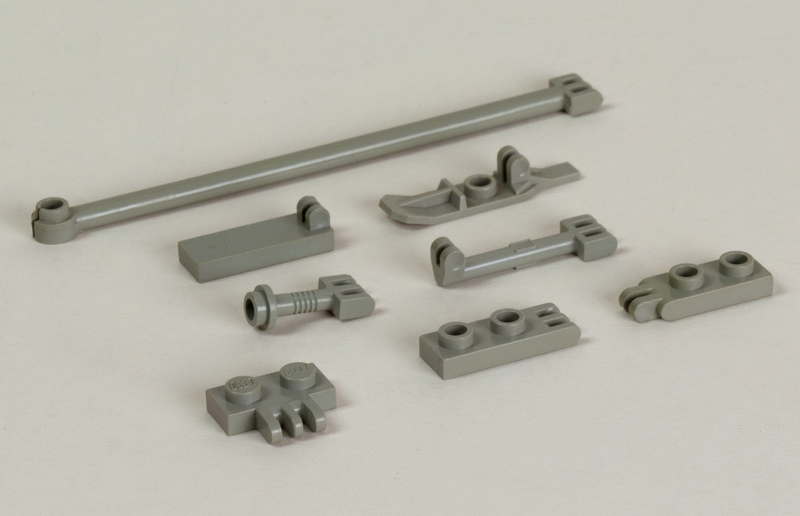 I see lots of new parts on the set, including giant locking rotator hinges (like the ones found with Ninjago's Samurai Mech, but much bigger), "tusk"/tail pieces that have an axle for connection to technic pieces, and more. Already saving up for it! Romford is not close to London, Romford is IN London. In the London Borough of Havering in east London. It has been ever since it was removed from Essex in 1965.